Pharmacies are an integral part of the healthcare industry. They provide a valuable decoupling between the doctor you see for an examination and potentially a prescription, and the institution that stands to profit from the medicine you pay for. Without this separation, there’s the potential for a conflict of interest where the physician examining you would profit more from giving you a prescription than they would from telling you that you’re fine and sending you on your way. I’m not trying to imply that bias has been entirely removed from the healthcare industry, but having independent pharmacies fill prescriptions from doctors does help. You unfortunately don’t generally see this sort of separation of interests in the alternative healthcare industry, where practitioners who claim to know the secret true cause of your “dis-ease” or “lack of wellness” (blocked chi, misaligned chakras, vertebral subluxation complexes etc.) also just so happen to also offer the solution; for a price, of course. This association between pharmacies and doctors leads pharmacies to be respected and trusted institutions. After all, we expect the person behind the counter – the pharmacist – to not only be able to dispense the correct amount of the correct drug we’ve been prescribed, but also to have a sufficient understanding of how it works so they can advise us on such things as precautions we should take. “Do I need to take this with food?”, “Will this make me drowsy?”, and so on. However, pharmacies also need to be profitable to work as a business, which is why you’ll also be able to find all sorts of non-prescription products for sale such as cosmetics and non-prescription medication. Because of their involvement with the healthcare industry and respected status, it’s important that these other products sold in pharmacies also be reliable, and they should not be stocked without good reason. Essentially, pharmacies should be held to a relatively high ethical standard. In New Zealand, there is a crown entity known as the Pharmacy Council that is established by the Health Practitioners Competence Assurance Act 2003. The Pharmacy Council is responsible for duties such as registering pharmacists and setting standards of conduct, although in cases where pharmacists require disciplining that is carried out by another crown entity also established by the Health Practitioners Competence Assurance Act: the Health Practitioners Disciplinary Tribunal. In order to ensure that pharmacists are held to an appropriate ethical standard, the Pharmacy Council has developed a Safe Effective Pharmacy Code of Ethics, published in 2011, which is publicly available on their website. Make the health and well-being of the patient your first priority. Promote patient self-determination, respect patients’ rights, autonomy and freedom of choice. Use your professional judgment in the interests of the patients and the public and promote family, whānau and community health. Show respect for others and exercise your duties with professionalism. Actively seek and apply contemporary pharmacy knowledge and skills to ensure a high standard of professional competence. Act in a manner that promotes public trust and confidence in pharmacists and enhances the reputation of the profession. Practise in a manner that does not compromise your professional independence, judgement or integrity, or that of other pharmacists. YOU MUST… Explain the options available to patients and the public, to help them make informed decisions. Make sure the information you give them is impartial, relevant, up-to-date and independent of personal commercial considerations. Any medicine, complementary therapy, herbal remedy or other healthcare product associated with the maintenance of health must have credible evidence of efficacy and safety (Code of Ethics 2011: 6.9). Health claims for complementary therapies or herbal remedies must be able to be substantiated and must not breach the Medicines Act with regard to therapeutic purpose. The five homeopathic remedies listed below are the active ingredients in No-Jet-Lag. If you’ve read my post on homeopathic dilutions, you may recall that “30C” means the ingredient has been diluted by 1/100 30 times. That is a mind bogglingly large dilution. If you were to end up with just one single molecule of the original ingredient at the end of that, you’d have to start with 1060 molecules of it. That’s a hard number to visualise though, and it’s hard to think of things in numbers of molecules, so let’s compare it to something more familiar. The Earth is made up of roughly 1050 atoms, so the amount of ingredient we’d have to start with would be roughly 10,000,000,000 (yes, that’s ten billion) times bigger than the planet. Even the Sun only has around 1057 atoms in it: still 1,000 times fewer than the number we’d need. Needless to say, after the dilution is done there is absolutely no amount of any of these ingredients remaining in any “NO-JET-LAG” pills. Knowing this, it seems rather implausible that they’d be effective for anything at all, let alone specifically preventing jet lag, but all the same it’s best to look at the evidence. The manufacturer’s website has a Scientific Test page. Now, given that I have spent some time writing up a complaint to the Advertising Standards Authority because I don’t think this evidence even comes close to being enough to substantiate the claims made about these products, I don’t particularly want to write out the same arguments all over again. So I am going to make this complaint public. While the first section specifically regards the instore display I saw in Parnell Pharmacy on the 2nd of July, the other sections are about the evidence regarding “NO-JET-LAG” and the ethical implications of my complaint, and these sections apply to all of the many New Zealand pharmacies that promote and supply this product. This complaint should be read with the following in mind: Assuming I am correct regarding the evidence for this product, I think the appropriate response of pharmacies stocking it would be to immediately remove it from their stock, and to apologise to the customers they have failed to protect. The Code of Ethics for an industry is the absolute minimum acceptable level of ethical behaviour, and it appears for all the world that many New Zealand pharmacies haven’t even been doing that. 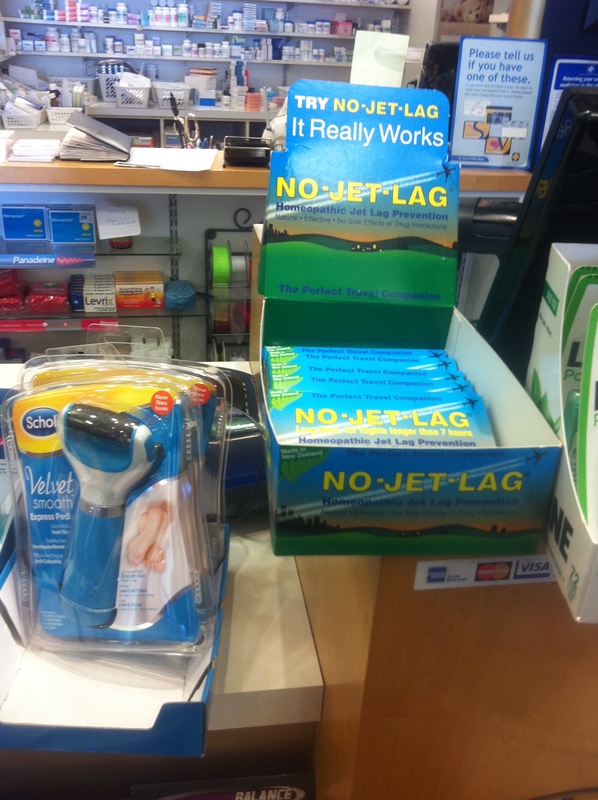 An instore advertisement for “NO-JET-LAG” in Parnell Pharmacy contains misleading therapeutic claims, in violation of the Therapeutic Products Advertising Code Principle 2. Because these claims are misleading, the advertisement also fails to observe the high standard of social responsibility required of it by the Therapeutic Products Advertising Code Principle 3. The strong and absolute therapeutic claims “Homeopathic Jet Lag Prevention”, “Effective”, and “It Really Works” require robust substantiation. Although it may not fall within the ASA’s jurisdiction, it is important to consider the advertisement within therapeutic context implied by its placement on the front desk of a pharmacy and by the prominently displayed name of the product “NO-JET-LAG”. Although it is not stated in the study, the POMS scale on which subjects rated their level of “fatigue-inertia” (the only measured end point reported to have statistically significant differences between control and experimental groups) is measured on a scale from 0-28. In this context, the mean difference between control and experimental groups of 3.84 is less impressive than in the context of a smaller scale that seems a sensible conclusion from reading the study, given that the y-axis of the bar chart only goes from 0-12. The non-significant measure of “vigor-activity” is similarly displayed on a chart with a y-axis from 0-22, whereas the actual scale is from 0-32. Also, the POMS scale includes 6 measurements, yet there is no mention in the study of having corrected their statistical analysis for multiple measurements. Assuming that no adjustment for this was made, as none is mentioned in the study, this means that although one of the 6 measurements purportedly reached statistical significance it is fairly likely to have been a false positive. From random chance alone, the chance that 1 out of 6 measurements would reach this level of statistical significance is approximately 1/4 (26.5%). A relatively conservative method of correction, the Šidák correction, would alter the required p-value for statistical significance in this case to 0.0085. However, the measurement’s p-value of 0.026 doesn’t even come close to crossing below this threshold and would therefore not normally be considered statistically significant. When asked if they knew whether they had taken the remedy or the placebo, they said that at the time of arrival in Germany the whole party all felt very tired but most were already fairly sure which treatment they had taken. On the outward journey, of the 19 taking part 13 (68%) correctly guessed whether they had taken the placebo or No-Jet-Lag. Of the others, three did not know and three incorrectly assigned themselves to the wrong group. On the return journey, two were incorrect, three did not know and 14 (74%) correctly guessed. Also, one of the study’s authors was the Director of Research at Miers Laboratories, the manufacturer of this product. It is not clear how much influence the manufacturer had over the study design or operation, or to what extent it may have been funded by them. So, as far as I’ve been able to find, the only evidence that could be used to support the very strong claims made on this advertisement is a small unpublished non-independent pilot study with questionable blinding that does not appear to have reached the threshold for statistical significance. In short, the claims do not appear to have been adequately substantiated, and should therefore be considered to violate the Therapeutic Products Advertising Code Principle 2. I sincerely hope that the manufacturer of this product has high quality rigorous scientific evidence that substantiates the claims made about this product hidden away somewhere and that, despite the fact that the only evidence they publicise on their website is the tiny low quality pilot study I discussed above, they have shared this evidence with every single one of the many New Zealand pharmacies who stock their product. If not, and things really are as they seem, then this would be an appallingly widespread violation of perhaps the most important part of the Pharmacy Council’s Code of Ethics.